I was surprised to read recently in Mindfulness-Based Cognitive Therapy for Depression that relapse has received attention from researchers and therapists only in the last couple of decades. The focus of most research has been the treatment of acute depressive episodes, and the effectiveness of medication or other therapies has been measured by the ability to demonstrate relief from those symptoms. Most researchers dealt with relapse as requiring more of the same methods of treatment rather than a new approach. Mindfulness-based cognitive therapy came about specifically as a way to deal with the problem of relapse. I wish I had known about it in the mid-1990s when I had one of my worst setbacks. That experience led me to search for new methods, and the combination of mindfulness and cognitive therapy finally helped me learn how to head off recurrence. Here’s what happened. I came to believe that depression simply kept on coming back independently of any external event (that part was true) and that I couldn’t do anything about it (not true). Psychiatrists kept me on the same medications. However, they not only failed to prevent relapse, they also had less and less effect on the major episodes. I kept on with psychotherapy as well – mostly the long-term talking kind, rather than the short-term cognitive varieties so widely used these days. I continued to learn a lot from those sessions, but recurrence remained the big problem. My exposure to mindfulness and cognitive therapy began at about that time. The learning curve was long and uneven, but eventually this approach provided some of the main techniques I use today to stay healthy. I have to say, though, that these tools did not work that well until I had achieved a more complete recovery than I had ever known before. At that point, just a few years ago, preventing relapse was my deepest concern, and this therapeutic approach proved to be the right one to help me. I’m no expert in the research-tested methods of mindfulness-based cognitive therapy. I first learned to use mindfulness meditation and then became familiar with the techniques of cognitive therapy even as the MBCT approach was coming into prominence. Much more recently, I’ve been working with MBCT directly, and it’s helping me enormously to refine and extend the techniques that have been most helpful. The core skill for me has been the ability to step aside from the depressive mindset as soon as it starts to set in. Meditation and mindfulness have helped me observe that mindset as a particular combination of thoughts, feelings, beliefs that accompany depression. This detachment helps me experience it as one possible mindset rather than buy into it as the reality of who I am. Then, instead of simply following that mindset back into depression, I’m able to stop the cycle before it begins. At once I say, as if talking to that mind: I see what’s happening and, no, I’m not going there. The process can begin at the first sign of a problem. For example, if I hear my mind starting to obsess about some mistake or flop of mine from last week, or, as is often the case, from 30 years ago, I recognize the pattern immediately. I can watch it unfold without giving it any credibility. Or I might notice that I’m walking somewhere, head bent down, feeling out of sorts and seeing only how rotten everything around me looks. I’m able to shake off off that mindset almost instantaneously. But it took a long time to get to that point. I spent about five years and lived through many relapses before learning the method well enough to make it automatic. Mindfulness-Based Cognitive Therapy for Depression (by Zindel Segal, Mark Williams and John Teasdale) is a great resource for learning the full scope of the approach from which I’ve adapted my basic method. The primary audience for this book consists of therapists who want to learn the practice, though it offers a wealth of insight for lay readers as well. 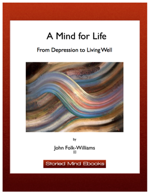 Another book by the same authors, along with Jon Kabat-Zinn, The Mindful Way through Depression is designed for a general audience and is easier to find. These books have helped me understand mindfulness in relation to depression as no others have. Perhaps they’ll help you as well. One thought stands out from reading about MBCT. It’s really not about learning a “technique” or “tool.” It’s more about finding a different approach to experience. Rather than isolate thinking as a source of depressive mood, as other forms of cognitive therapy do, it draws together the flow of thoughts, feelings and sensations through your mind and body as an integrated whole. How have you been able to deal with the recurrence of depression? Relapse is so often a hope-killer. Have you been able to get around the effect of these setbacks and keep going with treatment? Very good article, thank you for your honesty. I always support different methods to deal with depression as I am relapsing Again and I really do not want to go back on medication. Is it still possible to practice MBCT even when on medication and if yes is it effective? thanks for making this blog. it really helped. im at the tail end of a major six week relapse. i have a history of addiction and substance abuse as an earlier means of self-medicating. though i no longer use substances per se (at least not illegal or intoxicant ones) i substitute them w other things. this time it was soda and video games. ive been drinking ungodly amounts of coca cola (i avoid caffeine when i am functioning) and spending as much as 18 hours a day gaming. ive been calling in sick to work and school and lying about what im doing…none of my work has gotten done and im about 3 months behind. i used to be on welbutrin and for the first time in my life i stopped having suicidal thoughts. it was like a miracle. i was able to feel normal…all the human emotions without extremes. i was on it for about two years then i stopped because i felt like i could manage on my own. i eventually tapered off to none at all and though i was not at my best i was still free of suicidal ideation without effort until recently with this major relapse as described above including a toned down version of the SI (only once or twice as opposed to obsessively fantasizing about suicide daily and doing mock trial runs). id like to go back on the welbutrin and i think i will be seeking a dr for an rx, but i think that i would like to explore alternatives as when i am functioning my preference is healthy lifestyle w alternative medicines and therapies as opposed to pharmacological cures. do you think it is possible to achieve what welbutrin does for me without taking it? i want to be off the medication…but i dont know whether thats just the drug talking..if u know what i mean. i feel braver and confident now. i feel i can beat this. but iv felt so before and im scared to mess with the calm. my friend says its just lack of willpower and im giving in by continuing the medication now that i seem more my own self. what can i do?? i just got tired of crying and tired of messing everything up and so i got myself restarted on medical therapy. i want to pass my course. its thesis submission time and i cant afford a relapse. im ok now but still im being a stupid chicken.. im scared that the wave will drown me if i leave and im scared my brain will be forever hooked on the artificial sustenance if i dont. how do i do this? There is nothing wrong with taking medication – depression is an illness not a test of willpower. Don’t listen to your friend. One of the most common problems is people stopping medication because it’s working and they start to feel better. Let it continue to work so that you can get on with your life and explore your experience more fully in therapy. I do believe medication is not the whole answer and that depression requires inner work as well, but it’s not an either/or question. It’s both/and. If medication helps you don’t drop it! Talk to your doctor if you have any doubts. I hope things are going well with you. I too have some great fears about taking medication. I have a wonderful Phsychiatrist who has helped me gauge the right type of medication and medication levels for me. Every day I at least put down how I feel for the day. I didn’t want to be so “up” that nothing bothers me, and I didn’t want to have the perverbial dark cloud hovering over me. It is a delicate balance. I think my doctor put it best. “You should feel well enough that you can improve yourself at will. this willnot exclude bad feelings, but will help you function in day to day life. If you feel anything otherwise to consult your doctor.” I know what it is like to be scared. you don’t have to be scared here. It seems like everyone here wants to help. Stay strong and true to yourself. I have faith in you. Very good blog. Been on from time to time. Relapse is my life. John, I’m going to check out the two books you wrote about. So how is MBCT different from CBT? Or is it too hard to explain? Do I just need to read the books? One problem in trying to explain the difference is that CBT by this time probably isn’t a therapy itself so much as the general model that dozens of specific therapies are based on. The mindfulness version gets an equally strong foundation from mindfulness meditation – emphasizing the detachment from the chaotic flow of thoughts that Buddhist practice cultivates. That detachment makes it possible to pick out the thought patterns that distort experience and change them using some of the core methods of CBT. But I’m just learning about all this and have a long way to go to understand how the varieties of CBT differ. There’s DBT (Dialectical Behavior Therapy), ACT (Action and Commitment Therapy), REBT (Rational Emotive Behavior Therapy), Multimodal Therapy, and a lot more. So there will be many more posts to come as I try to apply these to depression. Great article. Don’t lose hope and keep the faith. At times it is difficult for us to get past the depression and everyone deals with it in their own unique way. Thanks for dropping by. I appreciate the comment.